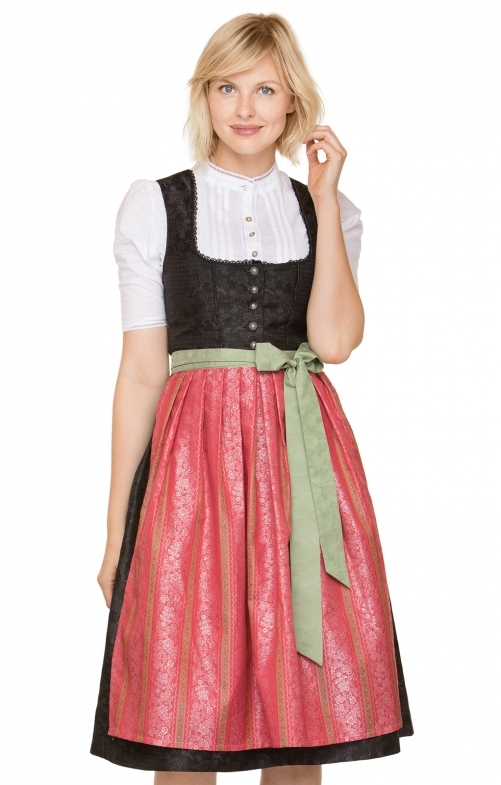 Midi Dirndl Mirelle for ladies by Stockerpoint in anthracite and spring. Provided with exclusive traditional patterns, the high-quality jacquard dirndl enchants with numerous loving details. The bodice is finished with delicate lace and the classic round neckline convinces with simple elegance. The traditional, silver-coloured buttons harmonize and set the unmistakable trend. The feminine, pleated skirt is equipped with a side pocket. The stylish apron in stripe design is wonderfully combined and refines this classic model.